سنة 1814 (MDCCCXIV) كانت سنة بسيطة تبدأ يوم السبت (الرابط يعرض التقويم كاملاً) التقويم الگريگوري، السنة 1814th بعد الميلاد (م)، السنة 814th في الألفية 2، السنة 14th في القرن 19، والسنة 5th في عقد 1810 بين 1583 و 1929 ومع فارق 1814 is 12 يوم عن التقويم اليوليوسي، والذين ظلوا مستخدمين حتى التحول الكامل إلى التقويم الگريگوري في 1929. 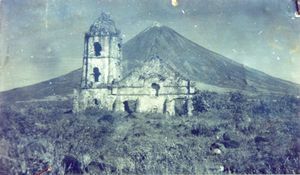 February 1: Cagsawa Church is destroyed by eruption of Mount Mayon. 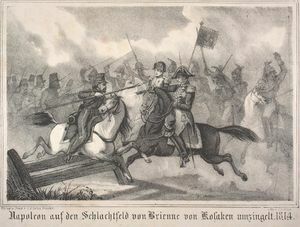 January 29 – War of the Sixth Coalition – Battle of Brienne: A French army led by Napoleon is victorious against von Blücher. January 31 – Gervasio Antonio de Posadas becomes Supreme Director of Argentina. February – George Hamilton-Gordon, 4th Earl of Aberdeen, represents Britain at the Congress of Chatillon. Lord Byron's semi-autobiographical tale in verse The Corsair is published by John Murray in London, and sells 10,000 copies on this day. Mount Mayon in the Philippines erupts the 2nd time; the Cagsawa Church is destroyed and devastated. February 10 – War of the Sixth Coalition – Battle of Champaubert: A French army led by Napoleon effectively destroys a small Russian corps led by Zakhar Dmitrievich Olsufiev, opening the Six Days' Campaign. February 11 – Norway's independence is proclaimed, marking the ultimate end of the Kalmar Union. February 12 – A fire destroys the Custom House, London. February 14 – War of the Sixth Coalition – Battle of Vauchamps: A French army led by Napoleon is victorious against von Blücher, the last major action of the Six Days' Campaign. February 17 – War of the Sixth Coalition – Battle of Mormant: A French army led by Napoleon effectively destroys a Russian division. February 18 – War of the Sixth Coalition – Battle of Montereau: A French army led by Napoleon is victorious against Austrian forces. February 21 – The Great Stock Exchange Fraud is exposed in London. March 7 – War of the Sixth Coalition – Battle of Craonne: A French army led by Napoleon is victorious against von Blücher. March 8 – War of the Sixth Coalition: A night attack by the British under Sir Thomas Graham on the French fortress of Bergen op Zoom ends in failure. March 9 – American naval schooner USS Enterprise reaches Wilmington, North Carolina, returning from participating in the War of 1812 against the United Kingdom in the Caribbean. March 10 – War of the Sixth Coalition – Battle of Laon: von Blücher defeats Napoleon. March 12 – Louis Antoine, Duke of Angoulême enters Bordeaux, marking the restoration of the House of Bourbon. March 25 – De Nederlandsche Bank is established. March 27 – War of 1812 – Battle of Horseshoe Bend: In northern Alabama, United States forces under General Andrew Jackson defeat the Creek Indians. 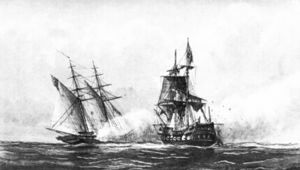 March 28 – War of 1812 – Battle of Valparaíso: Two British Royal Navy ships easily defeat and capture USS Essex and a sister ship off the coast of Chile. 30 مارس - دخول بريطانيا مع بقية دول الحلفاء إلى باريس بعد هزيمة نابليون بونابرت. March 30 – War of the Sixth Coalition: The Battle of Paris begins. March 31 – War of the Sixth Coalition: Coalition troops occupy Paris. March 9: The schooner Enterprise returns from the Caribbean. April 6 – Napoleonic Wars – Bourbon Restoration: Louis XVIII is invited to occupy the restored French throne. April 10 – Napoleonic Wars – Battle of Toulouse: The Duke of Wellington is victorious. April 11 – Napoleonic Wars – Treaty of Fontainebleau: The War of the Sixth Coalition ends, and Napoleon is forced to abdicate unconditionally, as Emperor of the French. April 12 – The Royal Norwegian Navy is re-established. April 18/19 – Genoa surrenders to the British Royal Navy. April 28 – The Ligurian Republic is revived. May 3 – The Duke of Provence, the future Louis XVIII of France, returns to Paris. May 4 – Ferdinand VII of Spain abolishes the Spanish Constitution of 1812, returning the country to absolute monarchy. May 5 – British-American War (War of 1812): British forces attack Fort Ontario at Oswego, New York. May 16 – William Brown, Irish-born rebel leader and future Admiral of the Navy of Argentina, begins a blockade of Montevideo, the colonial capital of Rio de la Plata. The Constitution of Norway is signed, and the Danish Crown Prince Christian Frederik is elected King of Norway, by the Norwegian Constituent Assembly. The occupation of Monaco changes from French to Austrian hands. May 30 – Napoleonic Wars: The First Treaty of Paris is signed, returning France's borders to their 1792 extent. Napoleon is exiled to Elba on the same day. June 6 – Tsar Alexander I of Russia and King Frederick William III of Prussia sail from Boulogne-Sur-Mer to Dover, on board the Royal Navy ship HMS Impregnable, as guests of George, Prince of Wales, the regent during the incapacity of King George III. June 17 – At London, Alexander, Frederick William and George exchange their ratifications of the Peace Treaty ending the war with France. June 20 – Gaspar de Vigodet, Spain's last colonial administrator of the Viceroyalty of the Río de la Plata (covering nearly all of modern-day Argentina, Chile, Paraguay and Uruguay), surrenders the city of Montevideo to independence fighters, led by General Carlos María de Alvear. July 5 – War of 1812 – Battle of Chippawa: American Major General Jacob Brown defeats British General Phineas Riall at Chippawa, Ontario. July 7 – Walter Scott's Waverley, his first prose fiction and one of the first significant historical novels in English, is published anonymously by Archibald Constable in Edinburgh, selling out in two days. July 13 – The Carabinieri (the national military police of Italy) is established by Victor Emmanuel, as the police force of the Kingdom of Sardinia. July 24 – War of 1812: General Phineas Riall advances toward Niagara Falls, Ontario to halt Jacob Brown's American invaders. George Stephenson tests his first locomotive Blücher successfully in England. War of 1812 – Battle of Lundy's Lane: Reinforcements arrive near Niagara Falls, Ontario for General Riall's British and Canadian force, and a bloody, all-night battle with Jacob Brown's Americans commences at 1800 hours; Americans retreat to Fort Erie. July 28 – The revived Ligurian Republic is dissolved. August 7 – Pope Pius VII decrees the bull Sollicitudo omnium ecclesiarum, reestablishing the Society of Jesus (Jesuits) all over the world, after having approved their survival and existence in Russia. August 9 – Creek War – Treaty of Fort Jackson was signed, ending the Creek War. August 12 – In England, the last hanging under the Black Act is carried out, of William Potter for cutting down an orchard (although the judge petitions for reprieve). August 13 – The Anglo-Dutch Treaty of 1814 is signed in London, returning most possessions of the Dutch Empire acquired by the United Kingdom since 1803 to the Netherlands, although Britain retains the Cape of Good Hope and the South American settlements of Demerara, Essequibo and Berbice (later consolidated as British Guiana). In addition, the British cede the island of Banca off the island of Sumatra, in exchange for the settlement of Cochin, India. August 24 – War of 1812 – Burning of Washington: British troops, after defeating American forces at the Battle of Bladensburg, occupy Washington, D.C., setting numerous buildings on fire, including the Capitol and Presidential Mansion. August 28 – Alexandria, Virginia, offers surrender to the British fleet without a fight. September 11 – War of 1812 – Battle of Lake Champlain: An American squadron under Thomas Macdonough defeats the British squadron, ultimately forcing the invading army to retreat back into Canada. September 12 – War of 1812 – Battle of North Point: An American detachment halts the British land advance to Baltimore. 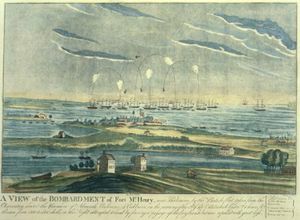 September 13 – War of 1812: The British bombard Fort McHenry at Baltimore. The British failure at the Battle of Baltimore is a turning point in the war, and the American defense of the fort inspires Francis Scott Key to compose the poem (later set to music as) The Star-Spangled Banner. October 17 – London Beer Flood: A large vat full of porter (beer) owned by Meux's Brewery of London bursts, demolishing buildings and killing 9. November 1 – The Congress of Vienna formally opens in Austria to settle the many issues arising from the French Revolutionary Wars, the Napoleonic Wars, and the dissolution of the Holy Roman Empire, with the European powers agreeing upon the redrawing of national borders following the victory over France; it will last until June 9, 1815. November 4 – King Charles XIII of Sweden becomes King of Norway, as Charles II . December 15 – War of 1812: The Hartford Convention is convened, by members of the American Federalist Party. December 24 – War of 1812: The Treaty of Ghent is signed, formally ending the war. December 25 – Samuel Marsden of the Church Missionary Society preaches the first sermon in New Zealand, at Oihi. Missionaries attempt to write down the Māori language. The world's first complex machine mass-produced from interchangeable parts, Eli Terry's wooden pillar-and-scroll clock, comes off the production line in Plymouth, Connecticut. ^ Jones, Neal T., ed. (1984). A Book of Days for the Literary Year. London; New York: Thames and Hudson. ISBN 0-500-01332-2. ^ "Waverley". Walter Scott. Edinburgh University Library. 2011-12-19. Archived from the original on July 2, 2013. Retrieved 2013-06-29. ^ Muir, Diana. "Chapter 10". Reflections in Bullough's Pond: Economy and Ecosystem in New England. Lebanon, New Hampshire: University Press of New England. ISBN 978-0-87451-909-9.